Sergei Kravchenko, the head of Boeing in Russia and the CIS, has said that if U.S. and EU sanctions against Russia remain in place or become tougher, Western companies will have to reduce their presence on the Russian market. The Coca-Cola Company, however, is under no circumstances prepared to leave the Russian market and views itself as a local player. If U.S. and EU sanctions against Russia remain in place or become tougher, Western companies will have to comply and reduce their presence on the Russian market, the head of Boeing in Russia and the CIS, Sergei Kravchenko, said at the St. Petersburg International Economic Forum on June 19. According to Kravchenko, his company always follows the letter of the law, and sanctions are “a set of laws.” He said would not like to do this “because we create hundreds of thousands of jobs in Russia.” At the same time, according to other entrepreneurs, business contacts between Russia and the United States have so far remained at the same level. However, trade between Russia and the United States dropped by a hefty 20 percent in the first quarter of 2015. “This indicates that business, which put up with it for a year, has begun to slow down after all,” Fomichev explained. “Technologically, the world is so complex that it is impossible to concentrate everything in one country. That is why we have not lost a single partner and continue to work with players like Boeing, IBM and Microsoft,” said Karachinsky. 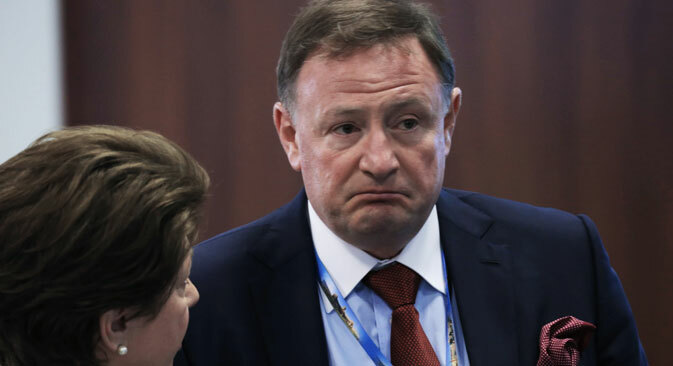 Chairman of the board of the Ilim Group, which specializes in timber and pulp exports, Zakhar Smushkin (net worth $750 million in 2015, according to Forbes), said that the weak ruble was helping to keep business buoyant. “Because of the depreciation of the ruble, we have seen a sharp rise in the rate of return; our financial situation has improved. However, a company that generates profit but does not carry out investment is a threat,” Smushkin said. He went on to add that if the freeze in Russian-U.S. relations, which he described as purely political in nature, lasts for a year or two more, this situation will slow down investment in Russia. However, when it comes to major Western investors into the Russian economy, said Coca-Cola’s senior vice-president Clyde Tuggle, they already feel like local players and are unlikely to go anywhere. “Looking at people’s incomes and a potential growth in consumption, there is no better market for our company than Russia. Current opportunities here are the same as they were before,” he said. Tuggle added that Coca-Cola owns 12 plants in Russia, which create 100,000 jobs for the local economy. “When I look into the future, to me Russia is one of our main markets despite the sanctions. Having said that, we as an investor need economic, political and public stability, we need predictability and transparency,” Tuggle continued. Thus, he said, he only had one request to make of the Russian authorities: for Coca-Cola to be treated just as any Russian company would be treated.